These sheaths from TAD gear have the nice characteristic of being able to be carried either in vertical or horizontal position. They are about 5 inches long and 1.5 inches wide with a velcro closure in a very long flap. To carry them in vertical position you use the belt loop in the back; to carry horizontally you use two smaller velcro loops across the main loop you can then attach the sheath to your belt in horizontal position and it will be more confortable. They are useful for flashlights, multitools such as the leatherman juice, SAKs, lighters, Survival capsules and other uses. Made of strong nylon with reiforced stitches the sheaths will resist every day usage bumps and scratches without breaking, the closures are solid. The main flap is so big that accidental opening is almost impossible. 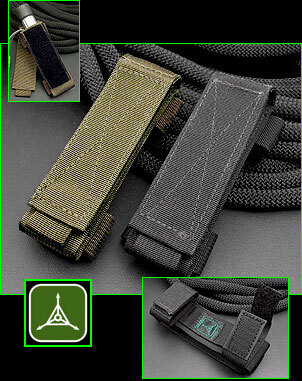 They are available in both green and black from TAD gear for $17. 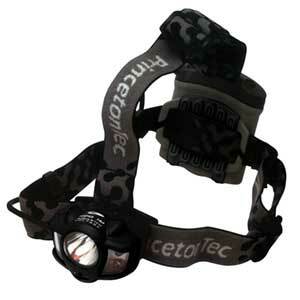 The Apex (and the upcoming Apex pro) are the top of the line headlamps from Priceton Tech. The headlamp has a Luxeon III LED as the main illumination source and four 5mm LEDs surrounding the luxeon, two on each side. Both the luxeon and the 4mm leds have 2 levels of brightness, high and low, the 4mm leds have a third mode for blinking. The idea is to use the 4mm leds for close works and long runtime and the luxeon led for distance. The leds are regulated offering flat light output regardless of the battery status. The batteries are 4AA batteries located in a carrier at the back of the straps. It can use akaline, rechargeable or lithium batteries indistinctly. Using alkaline batteries the Apex can run for 24 hours (1 hour of regulation) in its brightest mode and up to 108 hours (5o of regulation) using the 4mm leds in low mode. There is a battery life indicator to know the status of the batteries. To activate the leds there are two independant switches in the headlamp, turning one set of leds on will turn the other off, so it is not possible to use the luxeon and the 4mm leds at the same time, you have to choose depending on what you need. The luxeon throws really nicely and can reach long distances, the 4mm leds are fine for operation indoors or for close inspections. 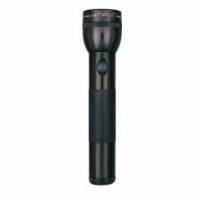 The light is waterproof and impact resistant, it is a little heavy and bulky for every day carry but can be packed in a bag or backpack for outdoor activities. If you need a dependable headlamp powerful enough to rival incandescent headlamps with the versatility and durability of leds the Apex is a great option. Available in black, olive green and orange. More information in the product page. You can get it for $64 from Lighthound. The leatherman Juice is a multi-tool that is smaller than the Charge, Wave and other big tools but larger than the Micra, Squirt and other keychain tools; a middle-sized multi-tool. The XE6 is the most complete model in this line. When opened the tool is a needle nose set of pliers, with wire cutters and hard-wire cutters. Without the need of opening the tool you can access the external tools from the handles: large, medium and small screwdriver. Extra small screwdriver. Phillips Screwdriver, lanyard attachment, can and bottle opener, corkscrew with assist, scissors, saw, awl, diamond file, a serrated knife and a plain blade. All the tools are non locking and very good in quality, the scissors and the can opener are particularly good. The can opener can be used to open boxes and other minor cutting jobs. The awl is useful whenever you neeed a pointy object. The corkscrew might be useless but can be used to attach a small eyeglass screwdriver accesory from Victorinox (idea). 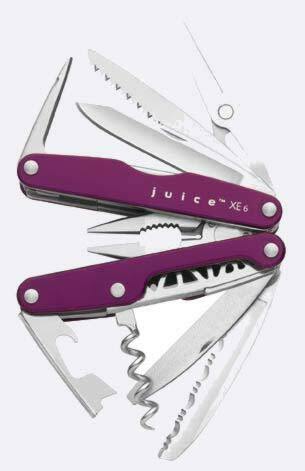 Made of stainless steel with anodized aluminium scales de XE6 is 3.2 inches long when closed (8.25cm) and weights 6.8 ounces (190 grams). The size of this tool makes it good for either pocket carry or a sheath, it is a very useful tool in a very convenient size. You can check the product page for more information. It is available in purple and gray for $72 from LightHound. 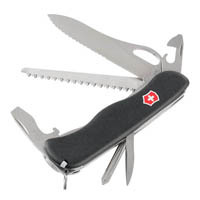 The "Trekker" is one of the multi-tools created by Victorinox for outdoor enthusiasts, this line has a bigger and better blade than the popular swiss champ and similar models. 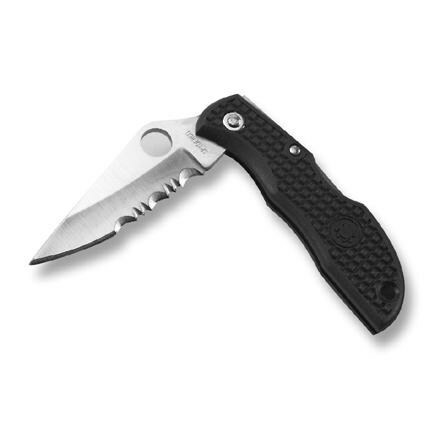 The most important tool in the trekker is a one-handed locking 3.5 inches blade. The lock is a liner lock and works fine. This blade is a lot better than the smaller blades in other SAKs but is probably not as good as the blade in a good quality folding knife. phillips screwdriver, key ring, toothpick,tweezers ,reamer and wood saw. The tools are good quality and combine to be a good combo outdoors. Being larger than the other SAKs the Trekker is probably missing a pocket clip to keep the knife securely attached to a pocket, it is probably too heavy to be inside the pocket or hanging from a keychain or a belt loop so amazingly there seems to be no good solution to carry it besides using a sheath. An horizontal sheath would probably be ideal since the knife is large to be carried in vertical position. You can read more and order for $47 from Victorinox's website. Other dealers may have special prices so you can do some research. 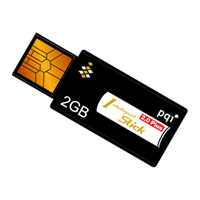 The PQI Intelligent Stick is a very small thumbdrive just 43 x 18 x 2.8 mm (1.69 x 0.71 x 0.11 in) and weighting 2.8gr 0.01lb the PQI is almost weightless and invisible. The thumbdrive plugs into any USB port offering from 32Mb to 2Gb of storage, some of the models have a small tab for write protection in the back and others don't. The transfer rate is very good, the drive has no pre-installed software and is not a U3 drive so what you see is what you get a small device for storage of your data. The PQI comes with a small credit-card plastic case that can hold 2 PQIs in case you want to carry them in your wallet. They are small enough to be in danger of getting lost but the case makes them lose the charm of the size. They are probably better without the case, hidding in a small pocket or a flap of your wallet. There is no attachment point for a lanyard or a splitring. You can get a 2Gb version for about $36 which is an excellent price from Newegg.com, you can read more about the drive and check the different versions available at PQI's website. You can also check a list of retailers here. A ROP is known among flashlight enthusiasts as "Roar of the Pelican" and is a popular project using a 2D maglite as a host and some special parts. If you have a 2D Maglite around you or can get one easily you may be interested in this Mod. Without any special skills needed, no soldering, no sanding, nothing you can turn your 2D maglite into a flashlight Beast with more than 500 lumen of power in your hands. This article published as a special feature covers all the materials you need for this project, pointers to some places to get them and instructions for the job. Once you have all the parts it just take 10 to 15 minutes to build your ROP and the result can be very rewarding. Read the complete article following this link. 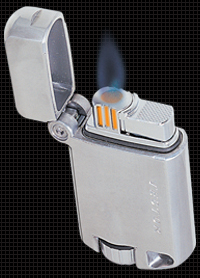 This lighter uses a system called "lean-burn" that basically generates a stable combustion by setting the platinum catalyzer in the middle of internal burner cylinder, which in turn generates a secondary gas combustion. This system reduces gas consumption and allows the lighter to work in limited oxygen environments like high altitudes.The flame is wind resistant and the case is strong to resist shock. It is not water proof so you need to avoid dropping it in water. The lighter is refilled by common buthane fuel and it has a small window in the back to see the amount of fuel left, this is a very useful detail that not all the top quality lighters have. The lighter performs very well, the lean-burn system is great to keep fuel consumption to minimum in long trips or excursions and the flame will be strong enough to resiste bad weather, rain and wind, being able to use it in high altitudes is another great advantage. The lighter is available in 5 different finishes and colors you can read more about it and order for $80 from the product page. 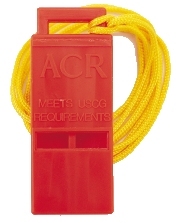 The ACR WW-3 whistle is a small flat whistle specially designed for emergency or rescue situations. The whistle is 1.0 x 2.0 x .25 in (2.5 x 5.0 x .6 cm) so it is really small and flat weighting just 1.4oz (4og) the flat shape makes it possible to be carried in a wallet or a small side pocket in a hat or other apparel. For a neck lanyard it is very confortable since the plastic is smooth and the flat shape makes it invisible under a t-shirt. It is probably one of the best options for a small emergency kit inside a small tin. It can also be carried in a keychain but that is probably not the best way to take advantage of the flat shape. The sound is loud producing a dual tone pitch that can be heard from long distances; it can be used in all weather conditions and it can be attached to rescue tools or equipment and be available in case of need. The whistle comes with a yellow lanyard and you can read more in the product page. This is a very small and flat pocket sharpener made of stainless steel with a tungsten carbide wedge. To use the sharpener just place it on a flat surface, a table, a rock, a tree branch etc and then slowly slide the edge of the knife downwards through the carbide wedge. With almost no pressure and a few passes any respectable knife will be razor-sharp, if the knife blade was very rough you may need some extra passes or apply some extra pressure. The sharpener is very gentle with the edge without leaving marks or creating dangerous dents. As small as it is you can put it almost anywhere and it will be unnoticeable, a very recommended companion if you frequently use edged tools. You can read more in the official website. Or you can order it for $12 from TAD Gear. The Pocket wrench II is a very small tool that can adjust nuts and bolts of different sizes the tool can also be used as a screwdriver, cap lifter, ruler and some other uses that depend on the imagination of the owner. The tool is only 4" long, 1" wide. The main feature of the pocket wrench is the wrench tool that using a micro serrated edge can handle hex nuts from 3/16" to 11/16". The bodie’s 1/4" hex opening accepts any 1/4" hex power bit, so you can easily drive virtually any style screw. There is also a ruler that can measure up to 5cm or 2 inches useful for measuring screws and bolts if you need replacements. The pocket wrench is made of 420 steel and is a very strong tool, it can go in a keychain unnoticed and be used to adjust hex nuts as long as they fit and about 90% of the hex nuts you may need to adjust will fit unless you are repairing the Golden Gate Bridge. For prepared individuals, craftmen or as a backup tool the Pocket Wrench is certainly great, it will fit your keychain without a problem and will be ready to be used in many situations. They can be ordered for $10 from McFeely's website. The Ladybug is one of the two keychain knives produced by Spyderco; the other one is the Jester, which is similar. This little knife is 2 and half inches long when closed (64mm) and 4 5/16 when opened (110mm), they are usually smaller than the palm of your hand when opened if a visual reference helps better than the measurements. The blade made of AUS-6 steel can feature either a plain edge or a spyderedge as in the picture. The lock is a lock-back mechanism located in the middle of the handle. It is easy to open, unlock and close the knife with one hand thanks to the location of the lock and the spyderhole in the knife's blade. The fiberglass reinforced nylon handle is covered by volcano-grip which helps avoid slippery accidents. Due to its size the ladybug can be carried in a keychain without being bulky, it can go in a coin pocket, a zipper pull, the bottom of a bag, pocket or purse it will be almost unnoticeable. The knife cuts really well, it can cut rope, cardboard, plastic and other every day materials without any complications, it is useful, safe and very practical. A scaled version of a serious folder that is really good for a keychain or a neck lanyard. The Ladybug costs about $30 you can read more in Spyderco's website or order one from REI or other dealers; they are quite popular. This is a tactical whistle hand made by Peter Atwood it is very sleek, durable and loud. 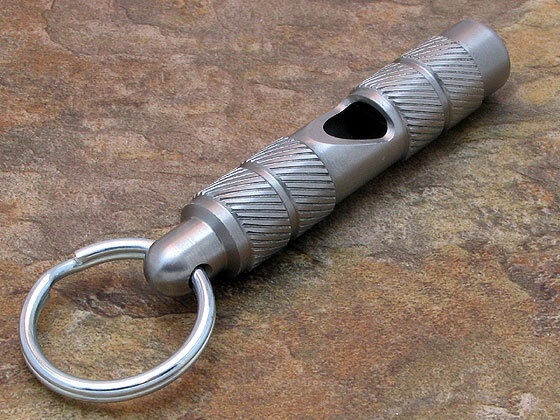 The whistles are made from a solid bar of 330 stainless steel they have a splitring hole for attachment they are 2.5" long so they can be carried in a keychain or around your neck without being a bulky item. The sound produced by these whistles is very loud and has a particular strong pitch so they are easy to recognize in noisy scenarios like sport events, concerts or school events. They can be used both in outdoors or urban environments to attract attention, call a group of people (kids) previously familizarized with the whistle sound, signal in case of emergencies, etc. They are not as loud as a Storm Whistle or a Fox40 but they are comparable to a Fox40 mini and the particular pitch makes the noise stand out. The construction is virtually indestructible and they will not have any problem with weather events, I don't know tests but I suspect the stainless steel construction might be unsuitable for boating due to corrosion. The whistles can be obtained for $35 from Peter Atwood's website and you can also read more about them there.